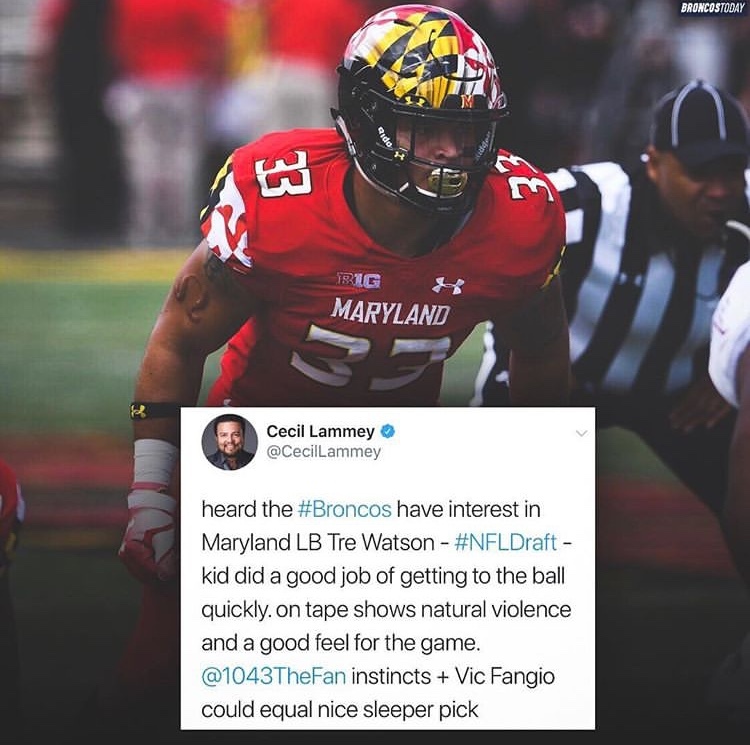 Cecil Lammy reporting that the Broncos are interested in Tre Watson. Wether it’s an early smoke screen or not who knows but I like this guy! He somewhat reminds me of TJ Ward with his ferocious physicality when attacking the ball carrier! Also pretty good in pass coverage, an area where Denver has struggled since Danny Trevathan! I'm just glad we are looking at ILBs!!! Look at impact t Leonard had as a rookie in Indy. If legit, YES! You sound as if your basing everything on what’s reported about him. I’d suggest watching his film and making your own conclusion! Always do your own research! i really like TJ Edwards from Wisconsin if we go LBer. i think he has been the best coverage LBer in the nation this year. I think Elway always knew ILBs with cover speed were important, it's just that he was striking out elsewhere in the draft. I find myself wondering why Denver doesn't just draft ILBs with cover speed to convert them to OLBs and return to a traditional 4-3 with Miller rushing on every play. Lol. Last edited by mozzerpete; 01-16-2019 at 01:33 AM. I understand speed can sometimes be over rated but I enjoy a lot of it. I hope he runs faster than Jewell did. I like TJ Edwards and hopes he runs very fast for 41 seconds straight. I would like to find a way to make Devin White and Devin Bush a reality. Josh Allen is more of DE for me. I like Ben Burr-Kirven. I think he is very fast with great cover skills. He is small 220-225. If he was 20lbs bigger he would be a first round pick. I would like to see him in the 3rd. Reminds me of Wesley Woodyard who I believe we let go way too early. I would be happier to take a QB, OL, or CB in the first 2 rounds (or one of the elite DL if they fall to us) and then grab a LB later in the draft. That being said, I understand the frustration and the opinion that we should invest in an ILB earlier. Smith, Vander Esch, Evans, and Leonard all look pretty good from last year. Love what the Cowboys did with their LB crew and look at the Colts with Leanoard. We need to have an identity at LB again and are getting killed because this group is so weak. Jewell is our best option right now - we either need to bring in some FA talent at ILB, or use one of our top 3 picks on the best available. I would love for us to double dip on ILB in the draft. Getting one in the first round and another in the mid rounds of the draft.